Not sure if you noticed (the savvy among you probably have), but KDP quietly rolled out their new reports format! I’ve wondered since I started with Kindle Direct Publishing why they could not plot out the master sales list for the titles Indies publish. Not only would it make for great nostalgia during those cold, isolated months of dead sales, and drive writers forward after seeing that, yes, there once was a day when you were knocking it out of the park (regardless of numbers; in this day and age, all readers are precious readers, in my opinion), but it’s important to be able to look back and see what you’ve accomplished in total. At least, my accountant thinks it is. KDP’s new Historical Report gives you every single sale monthly since you started publishing, and every single KOLL page read. This enables you to accurately track total sales, identify trends, and total your copies sold and free titles distributed since the dawn of KDP-time. The new format also sets up by sales period, and lists all royalties earned by country in total, which immediately gives you your best selling countries. The report still offers the month-to-date tables, but now provides a payments and pre-orders tab, all in one header. Slick, easy to use, and all in one place. A huge development for Indie writers everywhere! Stop looking at my short blue poles. I was busy writing. Go check our your new KDP report page! What do you think of it? Cthulhuian Canine Horror on Kobo! The interface is clean. Its links with Indigo are seamless, and the austerity of both the Indigo pages and the Writer’s Life sites are refreshingly anti-clutter. Also, Kobo likes free stuff. They avoid the tendency to control what their writers do with the pricing of their products. Downside? They take a bit longer to publish things. But, as I get older, I find that things that happen really, really fast are not always the best things. Therefore, I’m thrilled to announce that The Dog, my first cthulhuian short story (and the first of many more) is now live on Kobo. (The Dog went live on November 20th, on Kindle, too. If you’re a ‘Zonian and a fan of gothic horror, here’s the link). And, as an added bonus for being a fan of That Other Ebook Reader, I’ve thrown in a surprise. You’ll see it when you get there. Hope you enjoy it! If you did, please leave a review! 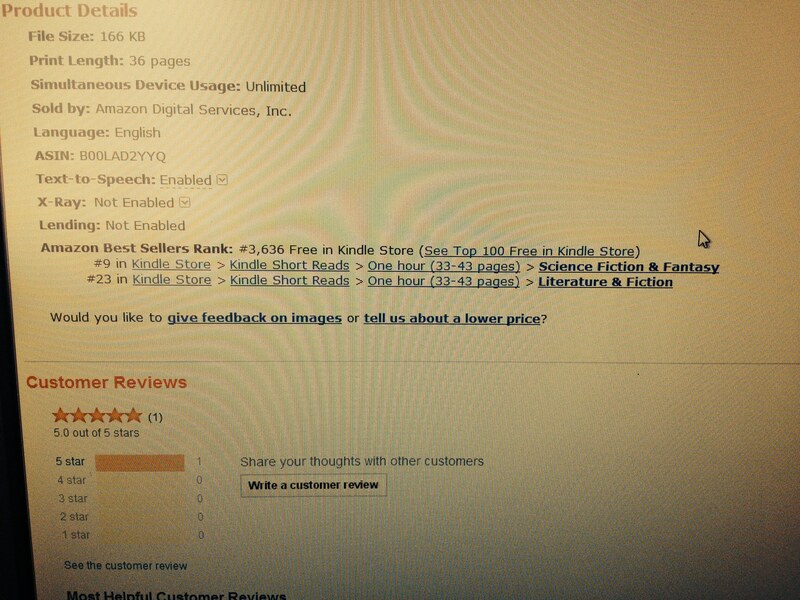 The Dog Released on Kindle! (Or, that night I took a walk and scared the baziggjuss out of myself and then wrote it all down). Horror is one of my favourite genres. I devour it. I love the old masters, and Lovecraft is my favourite of them. So much so that I’ve written several stories that are inspired by his work. I’m happy as Azathoth (in that cosmic, ironic futility kind of happiness, obviously) to announce that my first Cthulhian short story, The Dog, is now live and available for your consumption! May your pupils protect you from the ethereal terror that waits to unpeel your mind, and all that. If you enjoy it, please be so kind as to recount the delicious trauma I have caused you in a review on Amazon. And a few stars wouldn’t hurt. Don’t worry. They aren’t the same stars that bury aeons-old, writhing horrors that wait to awaken and shatter our complacency with destruction and madness. Here’s a link to the Kindle eBook! Don’t have a Kindle and still want to expose yourself to madness-inducing terror? Well, then, good for you. We should be friends. Here’s a link to the free kindle reader app for your laptop! Well, no. But I am thorough. You can also read any Kindle story on your phone or device with the free Kindle app, available when you click on the ‘Read with our free app’ link just under the Kindle price box. The Dog is also being released on Kobo this week, and I’ll post as soon as it is. Hope you enjoy it! I’d love to hear from you if you did! Achievement Unlocked: You Have an Editor! About a year ago, I stumbled over a title minnowing through my newsfeed. It was a free promo, and the description intrigued me, so I downloaded it. The book was called Sweet Violent Femmes by Holly M. Kothe, and it was one of the best Indie products I have ever, ever seen. I ripped through the book in one night. The theme throughout was the violent revenge of several women scorned. The tone and the writing left me stunned. I love dark fiction that makes me uncomfortable. Holly’s setup for her characters, how vulnerable they were, how driven and intent they were, were the perfect recipe to keep me locked in her pages. I remember thinking that I wanted my work to read like that. For my books to be packaged that professionally. I considered Holly’s collection of short stories my benchmark. Holly recently sent another minnow down my newsfeed. She had started an independent editing business. I wondered if this would be the chance for me to climb the writer’s stairs and improve my work. To get it closer to my expectations. It was time for me to take that next step. I scrounged my lunch money and emptied my writer’s account and borrowed change from my son. (Not really, but almost). I had no idea how much Holly would charge me for her work. I knew that editors are ridiculously expensive and meant only for the marble halls in New York and Who-do-you-think-you-are-anyway-having-real-writer-expectations-of-yourself? I looked into Holly’s site. Read the reviews by other writers. Counted how many writers she had edited. I studied their covers and Amazon pages. I narrowed my eyes a lot. These were pro writers with solid covers and there were a lot of them. I sent off the manuscript to Holly on May 6th . I received my contract and bill for half of her (VERY reasonable) price that afternoon. I signed the bill digitally, pressed send, and left the rest to the will of the Gods. I had the edited manuscript back in my digital hands on May 13th, and the invoice for the rest of her fee. Her work on the manuscript for my short story was exactly what I had hoped for. She was supportive, objective, clinical, and precise. I could not be happier with her work. With her edits and her suggestions for certain story flow mechanisms, Upon the Devil’s Shoulder reads like a polished, professional work. And I’ve already finished anther short for the anthology to send to her. See, because that’s what I’ve learned. How it works when you don’t self-edit, and leave that up to the pros. You can just go write. It’s a tough lesson to learn. I know not everyone is in the position to afford an editor. But, after spending 2 years rewriting To Drown in Sand (AFTER it’s been uploaded), when I could have used that time writing its sequel, I can no longer really afford not to. And I’m pretty confident, after seeing what this short story is becoming, that the result in quality will help me afford access to Espresso Editor a lot faster. I did not for a moment experience the insecurity/protective instinct that I’ve had in the past. Having read Holly’s work, I knew THAT was what I wanted my work to look like. In a way, she is her own best promotion. And I genuinely feel that I’ve stepped to another platform: from hobby writer to the real thing. Once you’ve read Upon the Devil’s Shoulder, you may agree with me. If you’re an Indie writer, and are considering going to an editor, stop. Don’t consider it. Go do it. And one of the brightest young women you could ever hope to find will edit your work quickly and quietly at Espressoeditor. Just don’t get her too busy. I would now be lost without her. What KDP Select taught me. Kindle Select offers quite the pull. As in, towards the Death Star kind of pull. I wondered. I agonized. I rubbed my knuckles on the bones of my forehead. The seductive potential of larger markets tapped at the glass in my dreams. Giving up other publishing venues for exclusive access to the Kindle Select pool makes sense to the hungry-for-reader writer in me. (Also, making money from someone reading 30% of my work, when the work can be a short story, REALLY made sense). So, I ran an experiment in KDP select. The results were poignant and huge. I wrote a (quite) short story, thinking that the 30% point would be quickly reached by a reader, and then no big loss if they quit after the first page (a theory of mine about free sample readers). I could still reap the benefits of the zillions of dollars in the KDP fund. I’m not the type to whine. 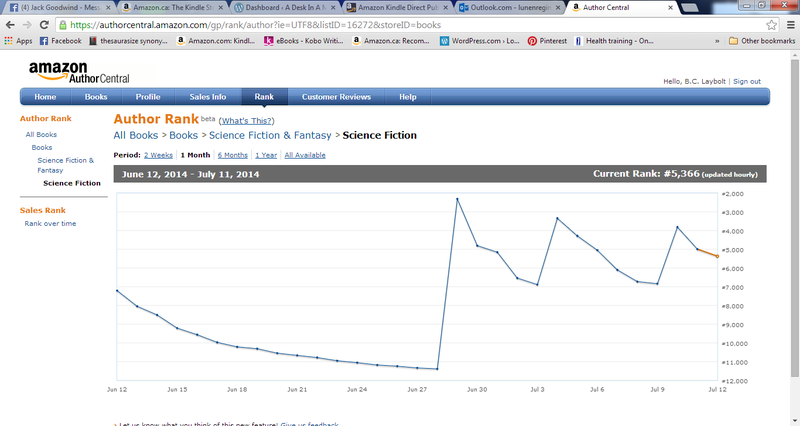 This was a marketing experiment, and I’m glad I dipped my toe in the Kindle Select pool. And, there were inherent process issues against me. I’m an Indie. I’m an unknown. The story may have been too short (although, I thought, for free under a Kindle Select membership, that wouldn’t matter). But in this pool, a shark took my toe, my leg, and pooped them out in the deep end. I also wanted an opportunity to start my fantasy writing. I find that genre has a wider base than the Military Sci-Fi market has for my other work. All this knowing that I still have not completed the ‘magic number’ acknowledged by most successful Indies by my research: Three Full Novel Titles In My Genre. Bone was released on Dec. 20th, 2014. It contained about four pages of promotional material, with links to my other writing, and about four pages of story. It has an awesome cover by the brilliant Dylan Edwards, and, in my humble opinion, is really quite good for a short. My free short story, Juris Lunence, had been enjoying at the minimum a download every day that led to one purchase of either Upon a Wake of Flame or To Drown in Sand every ten free downloads. On December 21st, 2014, all downloads of Juris stopped dead and have never recovered. I thought it was a glitch, or lead-in to Christmas, or celestial working of ancient, playful, blind Gods. 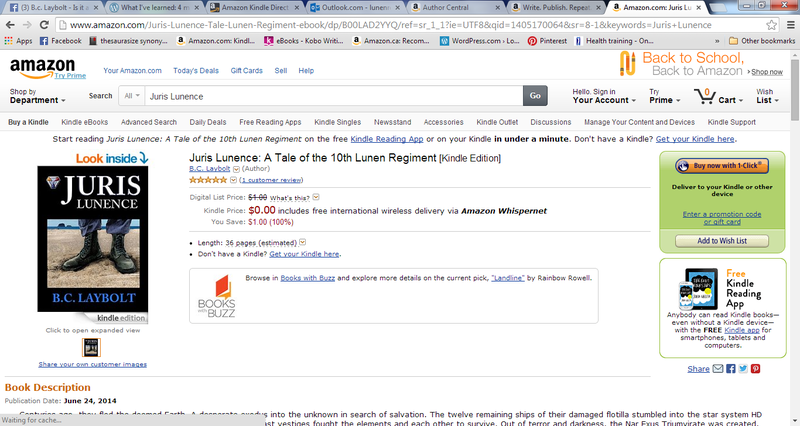 All of my work over 2 years digging through The Algorithm in KDP was undone in one night by signing up to Kindle Select. And, to challenge my sanity even further, I was now locked in for three months. 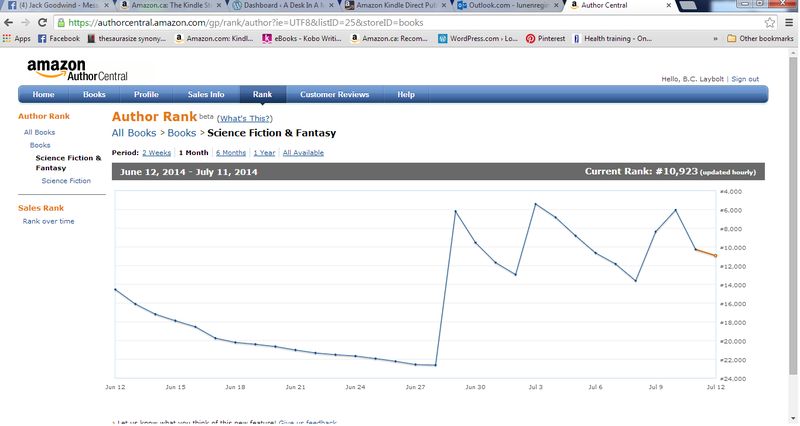 KDP Select destroyed the momentum I had built with my other titles. 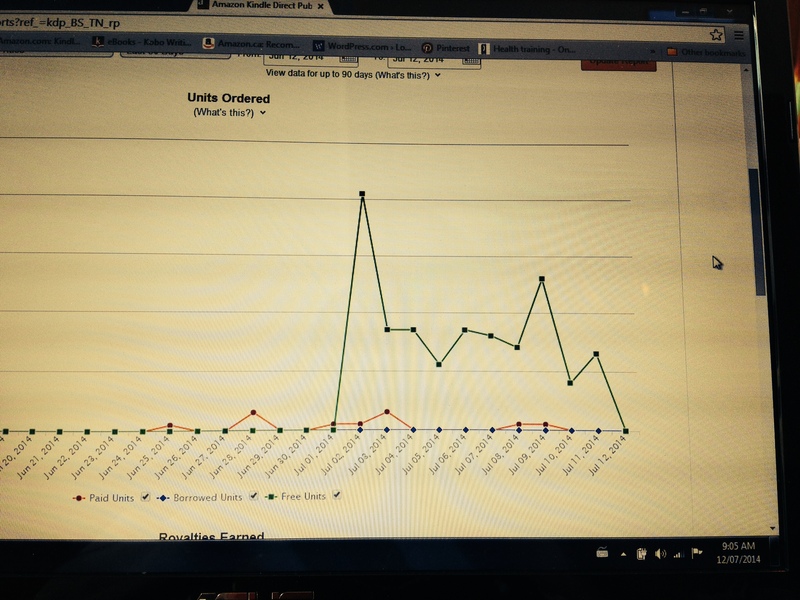 Free DL’s flatlined, and only now, FIVE MONTHS later, has the ‘once a day a new reader finds me’ process staggered back out of the KDP Select Sales Shredding machine. It’s wobbly and bleeding, but has started taking baby steps for me, as long as I promise not to do that again. No problem with that commitment. Because, after 3 months, Bone obtained ONE download. And that person did not read the required 30%. So, lesson learned there. KDP Select is not the system for me. At least not now, and not for my work in the Fantasy Genre. Bone is now released from the KDP Select isolation chamber. Amazon refuses to price-match it to free (like they did for Juris Lunence), so I gave it the cheapest price they allow, and left it on Amazon. It’s completely free on Kobo. So, from all things, lessons. KDP is great for some. Not for me. I got the coolest new cover yet out of the deal. And, during my promotional blitz, when Bone ran for free, it was downloaded in Japan, so we cracked another country. We are retrofitting the cover, and I’m hard at work on several short story projects (more on that in future posts) that is a construct for an anthology to introduce my fantasy novel series. Bend bad things into lessons, use lessons for good things. Tagged as Amazon, Amazon Kindle, Book Covers, Covers, createspace, E-Books, E-Publishing, Fantasy, Free Amazon books, Free E-books, Independent Publishing, Indie Publishing, Indie Writers, Indie Writing, Indy E-Pubbing, Indy Publishing, Indy Writers, KDP, KDP Select, Kindle, Kobo. What works with Amazon: An evolving education in Indie publishing. So. I conducted an experiment. My Indie Pubbing guru J.A. Konrath says it, too. More quality, more titles, more free. And Johnny B. Truant and Sean Platt describe it thoroughly, using the concept of Funneling. The Traditional Publishers still gnash their teeth, flap their tiny arms, and growl that not anyone can do this; that they have special services that guarantee quality and success. They’re right; they do. But I say anyone can make their own success, if you learn the game, and demand quality of yourself. Juris Lunence took only about four months to finish from initial draft, to polished, packaged, buffed, price on the windshield, and out on the lot. Plus, it was a lot of fun to write. So overall, not a loss of time in any way. It’s a short story prequel to Book 1 of my Trilogy, To Drown in Sand. Then, the FB group blitz. My poor followers. Their feeds must look like I’m a megalomaniac. Over 40 groups in one night, then roughly 15 more over the next few evenings. They were kind not to appear on my lawn with rage and torches. I purchased a small bottle of Goldschlager (one of those tiny airplane bottles, I’m not a drinker), my favourite Victory Juice. Parked it next to my laptop on the kitchen table, and waited. I was only going to open it if I hit 10 free downloads. Those little buggers are hard to open when you’re excited. I had to use my pliers. And here’s the total snapshot of Juris Lunence downloads, and what it did for To Drown in Sand (the little red lines at the bottom). Did I sell a lot of copies of To Drown in Sand? Not really, at least not yet. 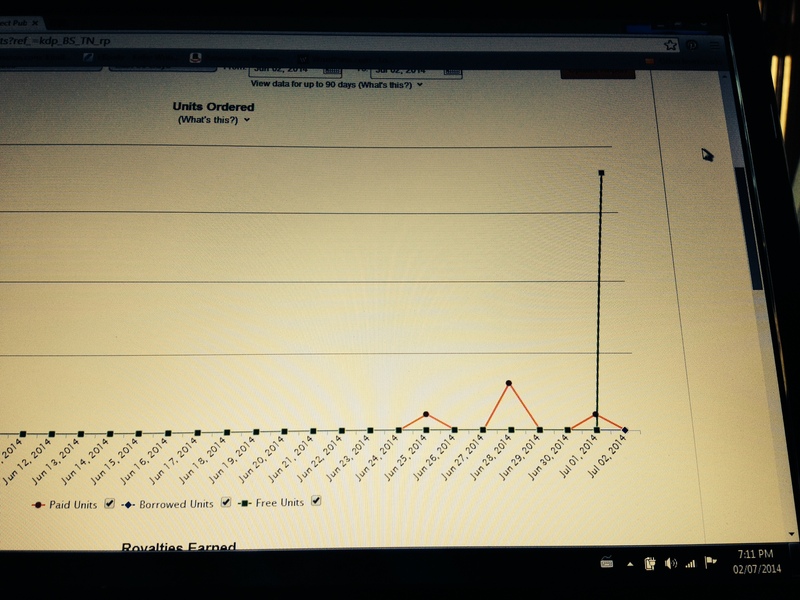 Did I sell more than if I hadn’t written and promoted a free release? Yeh. 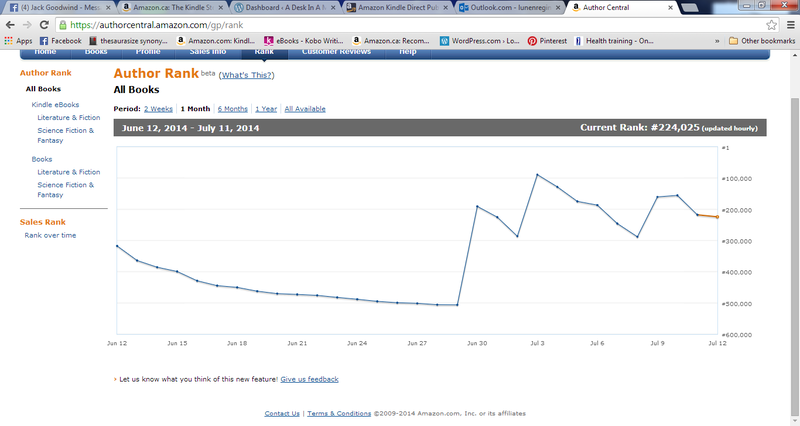 Did I climb through the Amazon algorithm and increase my Author ranking? You betcha. Did I gain new readers, and get over 100,000 new people looking at my title? Yip! Is Konrath and Truant and Platt right? Absolutely. The conclusion is pretty much irrefutable, which is rare in this Grand Indie Game. Free works as long as it’s quality. And anyone can make that happen.